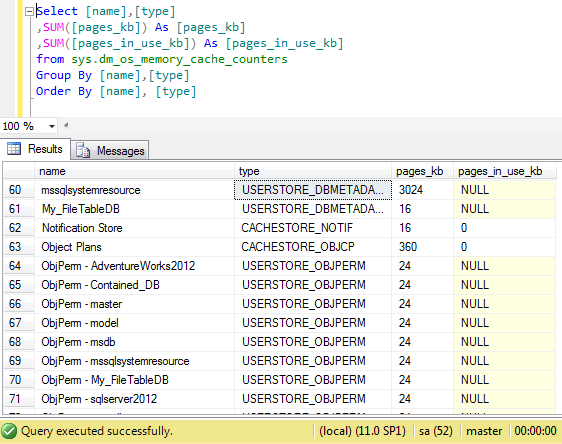 sys.dm_os_memory_cache_counters is one of the dynmaic management views shipped with SQL Server 2005. The major benefits of this dynamic management view is to provide the list of summary stating how cache is allocated against each request. 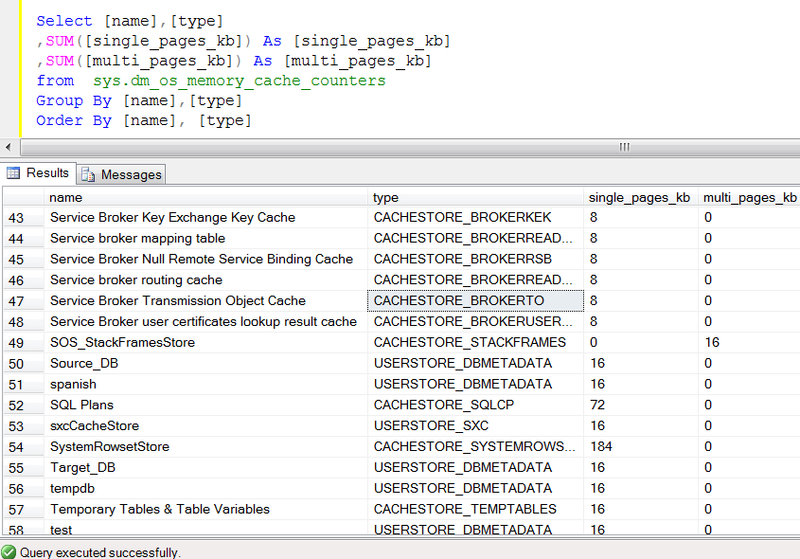 Given below is a simple query that will give the details about cache. --This query is compatibale with SQL Server 2005 and 2008 only. A few days ago I tried using the same query in SQL Server 2012 to check out the summary of cache but the above query did not work. Given below is the error detail. It generated an error. The first impression I got was that these two fields have been eliminated from sys.dm_os_memory_cache_counters in SQL Server 2012 ? But the answer is No, these field are not eliminated but renamed. Given below are the details. Lets rename the column in the above query and execute it again in SQL Server 2012. --This query is compatible with SQL Server 2012 and above. 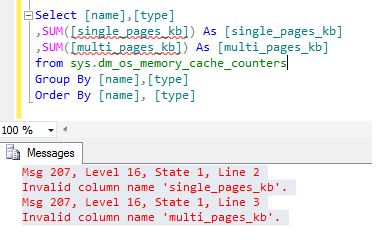 In SQL Server 2012, sys.dm_os_memory_cache_counters has renamed the two columns single_pages_kb, multi_pages_kb to pages_kb, pages_in_use_kb respectively. Remember to implement this renamed column change effects to avoid such errors. I have been using sys.dm_exec_requests for quite a long time and I have developed some tools to store certain request information using this dynamic management view. In the SQL Server 2012, sys.dm_exec_requests has a breaking change, which I realized once I deployed my tools in SQL Server 2012 and I was unsuccessful. Let me explain why and how did I fixed it. Given below is the script taken from one of the tools that is developed using sys.dm_exec_requests. Let me explain it step by step. Lets create a table (On SQL Server 2008 and 2012) to demonstrate it. Insert / Select records in the above temporary table in SQL Server 2005/2008. Insert / Select records in the above temporary table in SQL Server 2012. The above script executed successfully in SQL Server 2005/2008 but failed in SQL Server 2012. 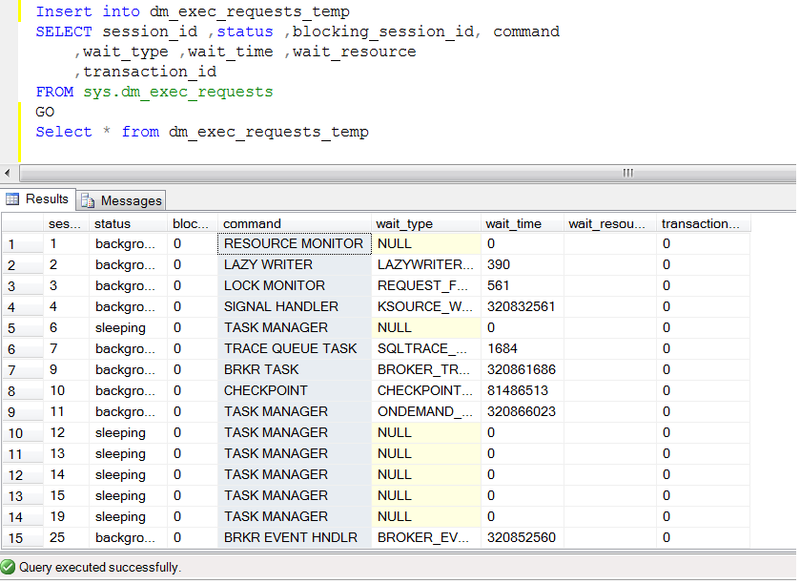 The reason behind above error is sys.dm_exec_requests has a column namely command. In SQL Server 2005/2008 the data type of command column was nvarchar(16) but it has been changed to nvarchar(32) in SQL Server 2012. As you can see, I created the column command in temporary table with nvarchar(16) datatype. To resolve above error, you need to change the data type of command column in temporary table (Step 1) from nvarchar(16) to nvarchar(32) and insert records again. In SQL Server 2012, sys.dm_exec_requests has changed the data type of column “Command” from nvarchar(16) to nvarchar(32). Remember to implement this data type change effects to avoid such errors. sys.dm_os_sys_info is one of the handy dynamic management views when it comes to query about the miscellaneous information of computer, resources & consumption by SQL Server. sys.dm_os_sys_info is with SQL Server family since SQL Server 2005, but whenever there is a new version of SQL Server, it always brings modification / additional helpful information in this view. But this modification / addition may break your code if you don’t consider these changes with respect to versions. To avoid any such errors, I have prepared a comparison sheet of different versions of sys.dm_os_sys_info along with the changes to make life far easier.